Computer hardware and software, Programming, Modelling and presenting data, Data handling, Control and monitoring, Digital Literacy. Worksheets, Research, Design, Planning, Revision. Phishing, Computer Programming, Graphics, Animation/Sound, Computer Control. Students complete 3 projects: developing a website, video editing and programming. Each project combines different tasks, building on skills developed in year 7 and 8. Research, planning, evaluation and gathering feedback. To provide students with an introduction to the skills, knowledge and understanding required to prepare for work in the information and communication technology sector. 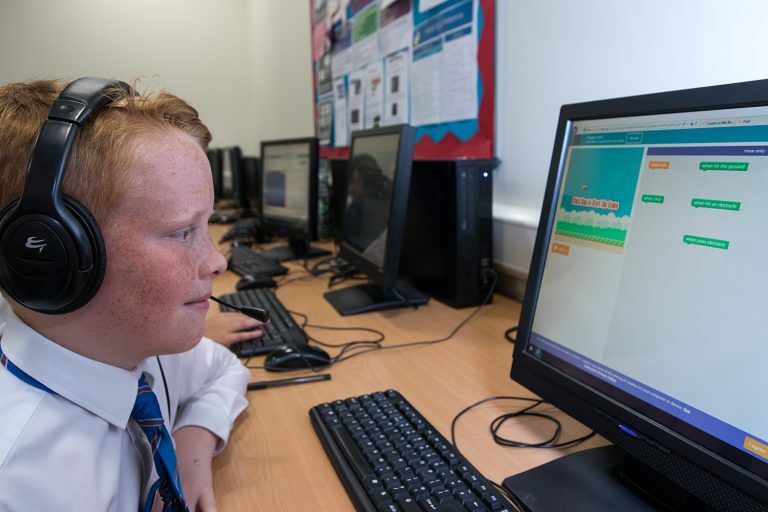 Students will use a range of application software and develop skills in reviewing, designing, creating and evaluating ICT products. Relevant to the modern and changing world of computer science. It is a practical subject where students can apply to knowledge and skills learned in the classroom to real world problems. It is an intensely creative subject that involves invention. Computational thinking skills will be practised to help students develop the skills to solve problems and design systems. These skills will be the best preparation for those who want to continue to study Computer Science at A Level and beyond. The qualification will also provide a good grounding for other subjects that require computational thinking and analytical skills. In Year 10 students begin with unit 2, “Technology Systems” and complete the unit with an online external exam. They also begin coursework for the mandatory unit, “A Digital Portfolio”. In Year 11 students use a range of software and develop skills in reviewing, designing, creating and evaluating ICT products. Students complete 2-3 units in web design, multimedia products and animation. Students follow the OCR ICT Nationals Level 2 course in ICT. Possible homework tasks include research of ICT products, planning, sourcing and storing resources, developing software skills, exam practice papers. Serif suite (discounted copies are available from school). To help students develop knowledge and understanding in specialist areas of Information and Communication Technology; to develop knowledge and understanding of the ICT sector; to develop ability to work autonomously and effectively in an ICT context; and to encourage progression by assisting in the development of skills, knowledge and understanding that students will need to access further or higher education or work based programmes. The combination of the core, mandatory and specialist units ensures that all students develop areas of essential information and creative technology understanding, as well as providing the chance to tailor the BTEC towards their specific needs and interests. Developed in close consultation with employers and educators, Unit 1: The Online World will help students to capitalise on the next internet revolution, and Unit 2: Technology Systems includes key concepts and processes which form the basis of any technology system and is relevant for many roles in the industry. Students will then get to complete a range of optional units including: Computer networks. Website development and mobile apps development. For more information on the computing curriculum please contact Mr Greaves in the first instance.